Our glass display cases are a necessity for any committed sports memorabilia enthusiast. Your timeless pieces whether autographed helmets or balls will be safe from dust and fading with our top-of-the-line exquisitely crafted cases. Each UV-protected display case is hand-made and includes a removable glass top for easy access. With a mirrored bottom and stunning cherry wood base your memorabilia will look stylish and protected in any setting. 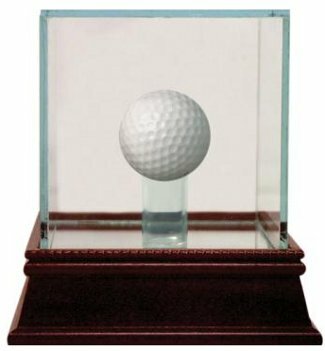 This single golf ball display case measures in overall size of 4.25 inches in length with a width of 4.25 inches and a height of 4.75 inches. Within the case there is 3.25 inches in length width and height available.